After a +25% increase over a five day period, we should expect some type of move lower. It’s easy to think that it is to ‘early’ to see a dip, but we have to think in matters of proportion – an increase of 25% is a significant rise. 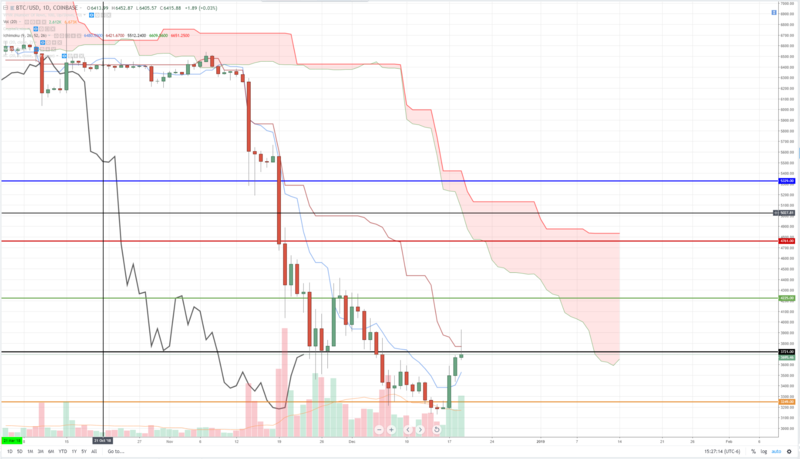 The probability of this dip was exacerbated by some key resistance levels in the Ichimoku system, which is what we are going to review today. Bitcoin has had a significant rise over the five trading days. We’ve observed Bitcoin move from the 2018 low of 3128.89 on December 15th to the most recent swing high made today (December 19th, 2018) of 3928.15. That move represents a +25.52% move – so it’s surprising that we would experience some profit taking and a technical pullback because that’s exactly what we are experiencing today. On the daily Ichimoku chart, we can see price faced some stiff resistance against the Kijun-Sen/Base Line at the 3770 value area – this is a shared value area with the 315-degree Gann Square of 9 level at 3721. This is the first daily test of the Kijun-Sen/Base Line since price fell through the 6200 value area back on November 13th. Any daily close above the Kijun-Sen/Base Line on the daily would indicate a high probability of a change in the overall trend. Bitcoin’s 4-hour chart shows some evidence of bullish behavior that could continue despite the most recent pullback. One of the traditional entries for a long trade in the Ichimoku System is when price and the Chikou Span/Lagging Span I above the cloud. That did occur, but price promptly moved lower bringing with it, the Chikou Span/Lagging Span moved below the cloud. A sign of weakness on this 4-hour breakout is also evident if we see price fail to maintain a close above the Tenken-Sen/Conversion Line on the first test of that line after a breakout. If price does close below the Tenken-Sen/Conversion Line, then price needs to find firm support at the Kijun-Sen/Base Line, otherwise, we will more than likely observe price continue lower. The 1-hour chart for Bitcoin shows some possible support for higher prices. While price has dropped below bot the Kijun-Sen/Base Line and the Tenken-Sen/Conversion Line, the Chikou Span/Lagging Span remains above the candlesticks. 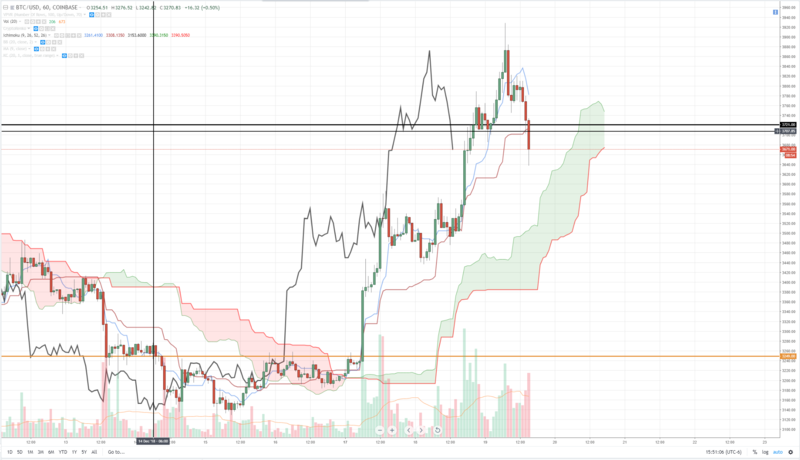 The next support zone in the Ichimoku system for the 1-hour Bitcoin chart now rests on the upper cloud. 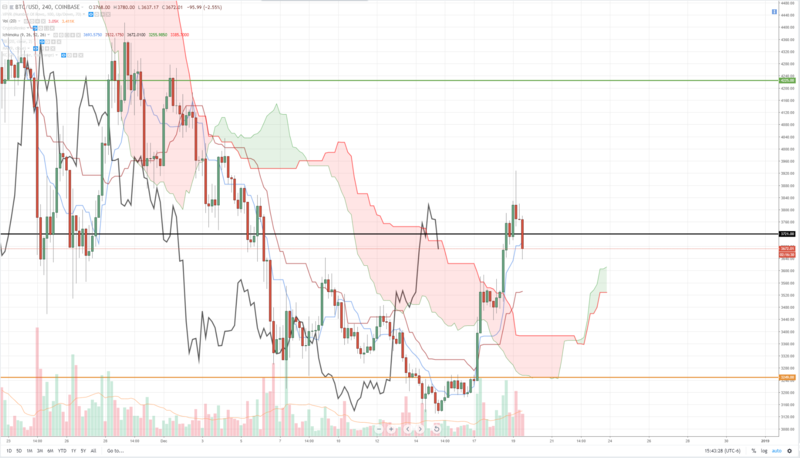 If Bitcoin can’t cross back above the Kijun-Sen/Base Line, we would ideally like to see price trade sideways until it intercepts the top of the cloud. Any further move lower at this current level would cause the Chikou Span/Lagging Span move into the current candlesticks and perhaps below the current candlesticks. The volume continues to be strong and so we see evidence of participation returning to the market. If we want to see a return to higher prices moving on into the future, then we want to see any of these normal pullbacks to be bought up and continue the trend higher. If prices move down on lower volume without any support, then we are more likely going to see a resumption of the bear trend.